This is a neat video that shows traditional Portuguese music known as fado. We made it to Michigan after a long day of flying. Laura was very well behaved, and is now enjoying being spoiled by her grandparents. Pray that we can be an encouragement while we are here in America for a few weeks. 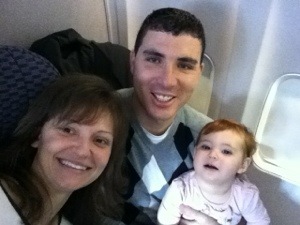 Here is a picture of us on the plane. We recently had some family pictures taken. Normally, Laura smiles and laughs very easily, but perhaps the pressure of a photo shoot got to her. Out of 150 pictures, these are a couple of the best. In other news, we are giving out pocket calendars with information about our church plant here in our town. Rather than do a mass distribution of these, we have encouraged everybody in our Bible study group to hand them out to their neighbors, hair stylists, people at the café, etc. The idea is to give something non-threatening to let people know about us and to spark in their minds the idea of their need for God. Psalm 73:28 It is good for me to draw near to God. Finally, on Tuesday and Wednesday of this week I will be at one of the local grocery stores helping with a food drive for needy families in our town. It is a good way show that we care for our community, and hopefully it will also be a good way to meet people. Pray that God would use the calendars and my time with the food drive for the furtherance of the gospel here.